US Secretary of State John Kerry (L) meets with Saudi King Salman bin Abdulaziz al-Saud on May 15, 2016 in the Saudi Red Sea city of Jeddah as Washington and Riyadh consult with each other ahead of another week of high-stakes diplomacy on the Syria conflict. STATE DEPARTMENT— U.S. Secretary of State John Kerry sought Saudi Arabia's support Sunday in strengthening a "cessation of hostilities" agreement between Syrian government forces and rebels ahead of broader talks on regional crises later this week. 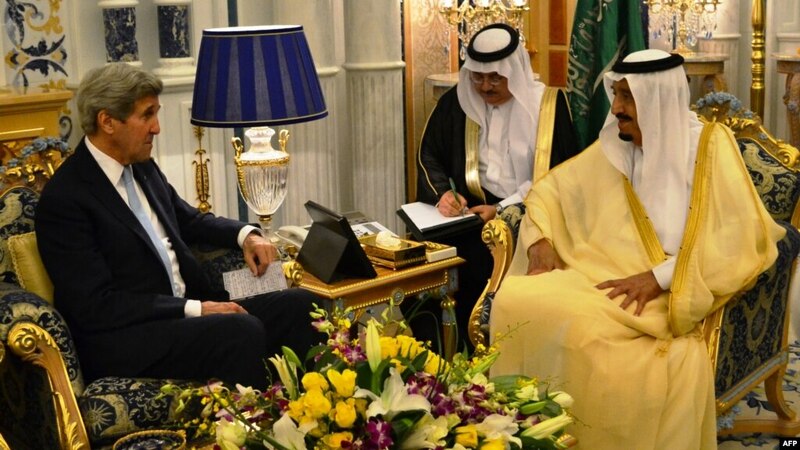 Kerry, trying to shore up support for the shaky cease-fire in Syria, met with Saudi King Salman, whose country has been a key supporter of rebels fighting to overthrow Syrian President Bashar al-Assad. The top U.S. diplomat and his Saudi counterpart, Adel al-Jubeir, discussed developments in Syria, the official Saudi Press Agency reported. Later, the top U.S. diplomat will fly to Vienna where he and Italian Foreign Minister Paolo Gentiloni will co-host a ministerial meeting on security and support for Libya's new government. Western powers hope Libya’s Government of National Accord can unite the country, which has been in a state of chaos since leader Moammar Gadhafi was toppled and killed in 2011. On Tuesday, the 17-nation International Syria Support Group (ISSG) will convene in Vienna to discuss the stalled political talks, difficulties in maintaining the February cease-fire and the U.N.'s uneven results in delivering humanitarian aid. However, the Syrian government's recent military advances may diminish the ability to restart political talks seen as the best hope for ending the war. “Not all of the trend lines in Syria are going in the right direction,” said State Department spokesman John Kirby. He commented on Friday, shortly before Secretary of State John Kerry departed on a two-week trip to the Middle East, Europe and Asia, where he will focus on issues including unrest in Syria as well as in Libya. In Syria, the U.S. and Russia began stepping in to broker a series of localized cease-fires in late April, to help keep a nationwide cessation of hostilities enacted in February from fraying. While the overall level of fighting between the government and rebels is down, tensions between the two sides have continued to flare. In late April, another round of U.N.-facilitated talks on a political transition in Syria ended with no face-to-face meeting between the government and the opposition. It is unclear when the next round of so-called proximity talks will take place. In an interview with Russia’s Sputnik news agency, U.N. Syria envoy Staffan de Mistura said he would await the outcome of the Syria support group’s session before convening another round of proximity talks. Some analysts say Syria’s military dynamics could hamper progress in proximity talks. What matters is the “leverage that you bring into the room,” said Atlantic Council Middle East analyst Nussaibah Younis. “With the backing of Russia, the Assad regime has managed to make some real progress in its fight against the rebels,” and, as a result, will be unwilling to compromise, she said. Russia said it would use Tuesday’s session to call for an end to commingling between terrorist groups and rebels in Syria. Additionally, while Kerry is in Vienna, the U.S., Russia and France will focus on an effort to help stabilize Nagorno-Karabakh, a disputed territory between Azerbaijan and Armenia, which is officially part of Azerbaijan. In April, the region suffered one of its worst outbreaks of violence in years. After Vienna, he will attend a NATO ministerial meeting in Brussels and then will travel to Myanmar in a show of U.S. support for the country’s newly elected government. In Yemen, a suicide bomber standing in a line of men at a police recruitment center near the southeastern port city of Mukalla exploded himself, killing at least 25 people and wounding 60 others. Medical officials said those who survived the blast were transported to a local hospital. IS posted a statement online claiming responsibility for the bombing, the second this week in Mukalla, which is generally known as a stronghold for rival Islamist group al-Qaida. Forces of Yemen's internationally recognized government recaptured Mukalla last month from al-Qaida, which had controlled the city for a year. On Thursday, IS claimed responsibility for a suicide attack on a naval camp that killed 10 soldiers and wounded another 15.